America Revealed: Why Mitt Romney Should "Be Concerned About the Very Poor"
Why Mitt Romney Should "Be Concerned About the Very Poor"
Last week's news reports included the jarring juxtaposition of two very remarkable stories. The first was Mitt Romney's amazing confession that he didn't lose any sleep over poor people in America. Or to quote the candidate: "I'm not concerned about the very poor. We have a safety net there. If it needs repair, I'll fix it." He went on to say that he was also "not concerned about the very rich. They're doing just fine. I'm concerned about the very heart of America -- the 90-95 percent of Americans who right now are struggling." The second story that contrasts sharply with Mitt's mistake was reported in a New York Times seriesabout the 40,000 homeless people now living in New York City. The story points out that most of New York's homeless are working families with kids and parents commuting long distances from shelter to school and work. Today, there are more homeless New Yorkers than at any time since we started collecting data on homelessness. There are many causes of homelessness just as there are many causes of poverty. Poverty must be seen as a relative rather than absolute status. Poverty in America is not the extreme poverty that my Earth Institute colleagues are working on in Africa. 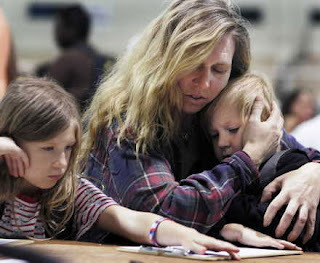 Most poor people in America are not in daily danger of starvation. In Africa, the issue is often sheer survival. But even when there is sufficient food and shelter to scrape by, poverty's impact, especially on children, can be devastating. You don't need to be in imminent peril to feel poor. To hear a Presidential candidate dismiss the issue, even as he dials his comments back and tries to retract them, is still unbelievable. Then there is his assertion that 90-95 percent of the country is "struggling." For a guy with a reputation for being a sharp analyst, those numbers are pretty far off. I very much doubt that 95 percent of the country is now struggling. The official poverty rate is about 15 percent, and some analysts believe the actual rate is closer to 25 percent. Many working families are staying in the middle class by working multiple jobs and long hours. Lots of people are in rough shape, but if the number was 95 percent, there'd have been riots in the streets this past weekend instead of Superbowl parties. Is this really the same guy who ran a (very) profitable business, managed a successful Olympics and did a decent job of governing Massachusetts? Perhaps it really is true that running for president can damage ones intellectual capacities. I agree with Governor Romney that we must rebuild the wealth and confidence of the American middle class. But I also think that we have a moral responsibility to understand and address the issue of poverty here in America. Despite the Great Recession, America remains a land of almost unimaginable wealth and plenty. Poverty in the midst of great riches is at best puzzling and at worst a failure of a community's ethics. The causes of poverty are complicated and I do not pretend to understand all of them, but we deserve an honest discussion of its causes and its cures. I want a president who is concerned about poverty and worries about how to break the cycle of poverty we see here in America. I want a president who pays attention to issues not just because his pollsters tell him to, but because he sees a problem that government must try to address. I accept the idea that there are different ways to address poverty. Conservatives believe that a rising economic tide lifts all boats. That may be true -- but first you've got to have a boat. Otherwise the tide simply sweeps you away. It is clearly true that a shrinking economy hurts poor people more than it hurts wealthier people. So any real solution to poverty must involve both economic growth and economic mobility. In a global economy with foreign governments assisting their own corporations, a totally free market in America will not create the growth or the mobility we need. Nor will government-managed corporations. We need a sophisticated relationship between government and the private sector to achieve both economic growth and economic mobility. FDR's New Deal and LBJ's Great Society/War on Poverty were the last two concerted efforts to reduce American poverty. Neither achieved perfect success, but both reduced poverty. The New Deal established the "safety net" we hear so much about today and the War on Poverty reduced the poverty rate to about 10 percent -- still the lowest rate in American history. The New Deal probably saved American capitalism by laying the foundation for the great American middle class that was finally built after World War II. In both cases, government carved out an effective role in the nation's economic life. Assuming Mitt is finally able to close the deal and secure the Republican nomination, the fall campaign should be interesting. Mitt has a particular problem this fall. He must maintain the Republican base, including the Tea Party, while moving to the political center to attract the largely a-political independent voter. Obama will be doing the same as each tries to redefine the political center in their own image in order to win the election. Despite the efforts to strip Obama of the legitimacy of his presidency, President Obama still has the advantage of incumbency. The American President is both our head of government and head of state. As head of government he is Prime Minister. As head of state, he is our monarch, representing the nation and providing a useful symbol of unity. Presidential incumbency is a powerful political tool. As Governor Romney moves closer to the Republican nomination, he needs to understand that moving forward he must play error-free ball. No more dismissing poverty, $10,000 bets, or delays in disclosing his income. Any more fumbles and Mitt will end up retreating John Kerry-like to his many sumptuous homes.